The human body is a single unit composed of a seemingly infinite number of biologic processes. However, did you know that abnormalities of almost any of its parts can, and do, have profound effects in multiple areas? For example, the body's inflammatory and immune (resistance) systems, responsible for defense against infection and promotion of healing, are an active participant in many chronic diseases. And chronic or longstanding diseases, in which attempts to heal are frustrated by continual inflammation and infection, include high blood pressure, diabetes and arthritis among others. 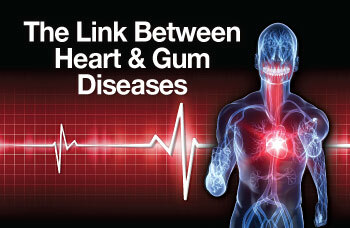 This is also true for Cardiovascular Disease CVD (“cardio” – heart; “vascular” – blood vessel) and periodontal (gum) disease. Indeed, both of these diseases appear to be linked by inflammation. The good news is that, based on current research, we know that if we can reduce the inflammation caused by periodontal disease, we have a good chance of reducing the risks for heart attacks and strokes, both of which are common results of CVD. The root causes of periodontal disease are irregular and/or ineffective brushing and flossing. When left, the bacterial biofilms (dental plaque) change over time and lead to the emergence of a small set of highly pathogenic (“patho” – disease; “genic” – causing) organisms that are consistently associated with periodontitis (“peri” – around; “odont” – tooth; “itis” – inflammation). These bacteria both activate and disrupt many of the normal protective mechanisms that help clear them from your mouth. More importantly, if the bacterial biofilm is not removed daily, it activates inflammation in the gums that, in turn, can destroy the connective tissue and bone that support the teeth. Periodontal disease is a very common disease with mild to moderate forms affecting 30% to 50% of US adults and more severe forms affecting 5% to 15%. It is a silent, painless disease that often occurs without any symptoms. Periodontal disease does produce systemic (bodily) inflammation, but it is not captured by current standard laboratory tests. More sophisticated measures do show markers of inflammation but, in effect, individuals with uncomplicated periodontitis have no signs of infection, such as fever. However, a generalized bodily inflammation smolders in the background like embers of a fire, awaiting the right conditions to be set ablaze. And it is this chronic, low-grade inflammation throughout the body that appears to increase the risk for heart disease and stroke substantially. Inflammation is not just something that affects your gums, joints and other connective tissues of the body. A study published in the Journal of Periodontology reported that inflammatory effects from periodontal disease cause oral bacterial byproducts to enter the bloodstream and trigger the liver to make proteins such as CRP (C-reactive protein) that inflame arteries and promote blood clot formation that can contribute to clogged arteries leading to heart disease and stroke. CRP is an inflammatory marker that can be measured by blood tests. A recent study published in The New England Journal of Medicine identified elevated CRP levels as a stronger predictor of heart attacks than elevated cholesterol levels. In the future, patients could receive routine CRP testing in their dentist's or periodontist's office. This could help early identification of risk factors for heart disease or stroke and since patients see their dentist at least twice a year, a significant improvement in early detection may be possible. Appropriate strategies for treating periodontitis focus on the resolution of inflammation by removing the bacterial biofilm attached to roots of the teeth, along with education to reinforce oral hygiene and reduce bacterial re-growth. Antibiotics may briefly improve sites of localized periodontal infection when combined with professional tooth cleaning to disrupt the biofilm. While antibiotics markedly reduce bacterial amounts, taken alone they do not usually eliminate the disease-causing strains that may be residing in your mouth. Drugs that modulate or damp down the inflammatory response may reduce the progression of periodontal disease. Low-dose doxycycline, which has an anti-inflammatory effect, is the only FDA-approved drug for treating certain forms of periodontitis. Other non-steroidal anti-inflammatory drugs (e.g., aspirin and ibuprofen) have been extensively studied for use in periodontitis, as have drugs for osteoporosis, such as alendronate, but these are not currently being pursued for periodontal therapy. Advanced periodontitis may require surgery to gain adequate access to contaminated root surfaces for removal of the bacterial biofilm. In some instances, surgical approaches include bone and soft tissue regeneration to regain at least some support for the teeth and to facilitate bacterial control. Environmental and genetic factors, as well as acquired risk factors, are now understood to not only modify, but also accelerate the inflammatory processes in gum disease. Smoking, diabetes, genetics, mental anxiety, depression, obesity, and physical inactivity are strongly linked with increased risk for and severity of periodontitis. Today, approximately 50% of the variation in how severe periodontal disease manifests is explainable by genetic influences. Periodontal disease is more severe and prevalent in individuals with diabetes, a disorder of the body's ability to use glucose (normal body sugar) for energy production and its storage, as discussed at length in the Dear Doctor magazine article “Diabetes and Periodontal (Gum) Disease.” Individuals with diabetes and periodontitis also experience a faster rate of loss of tooth-supporting bone than those without diabetes. References: The American Journal of Cardiology and Journal of Periodontology Editors' Consensus: periodontitis and atherosclerotic cardiovascular disease. Friedewald VE, Kornman KS, Beck JD, Genco R, Goldfine A, Libby P, Offenbacher S, Ridker PM, Van Dyke TE, Roberts WC. Am. J. Cardiol. 2009 Jul 1;104(1):59-68.